Samajwadi Party's Azam Khan was booked for making an 'indecent and derogatory' comment against BJP candidate from Rampur, Jaya Prada, while Maneka Gandhi had to face the heat for allegedly trying to incite communal strife. 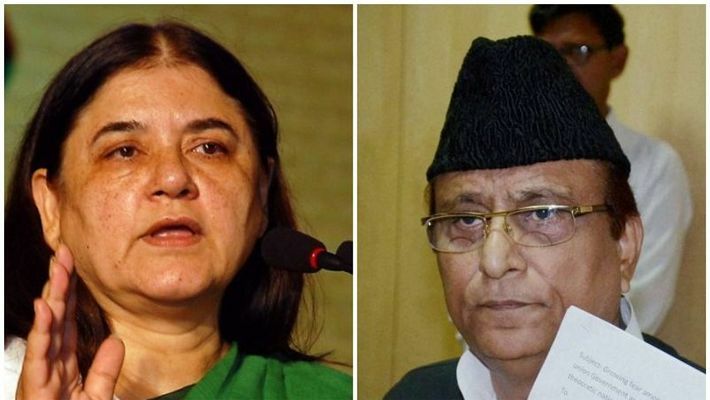 New Delhi: After penalising Uttar Pradesh chief minister Yogi Adityanath and BSP supremo Mayawati for their controversial statements in the run-up to the general election, the Election Commission has now decided to crack the whip on Azam Khan and Maneka Gandhi too for violating the poll code. Khan and Maneka have been banned from campaigning for 72 and 48 hours respectively. Samajwadi Party's Khan was booked for making an “indecent and derogatory” comment against BJP candidate from Rampur, Jaya Prada, while Maneka had to face the heat for allegedly trying to incite communal strife. According to the commission, Khan's comments on Jaya Prada "may be construed as being repugnant to the honour and dignity of women". Bringing up a similar ban on the Samajwadi Party leader in 2014, the commission said, “He has not 'changed his way of campaigning and he is indulging in using very objectionable language.'" While addressing a group of Muslims at a rally in Uttar Pradesh's Sultanpur, Maneka said that she may not be too inclined to help Muslims if they did not vote for her. Maneka said, "If my victory is without Muslims, I won't feel that good... Then when a Muslim comes to me for work, I would think, 'Let it be, how does it matter?' It's all give and take, isn't it? We aren't all sons of Mahatma Gandhi, are we? It's not that we keep on giving and then losing in the election. This victory will happen with or without you." The poll panel said that the Union minister has violated the rules that bar appealing to caste and communal feelings, including “corrupt practices” such as bribery and intimidation. Maneka is contesting from the Sultanpur seat, held by his son Varun Gandhi. However, is the two-three-day ban enough for repeated poll code violations? Do such infractions demand stricter punishment? Some are of the opinion that the bans will have severe impact on Khan and Maneka's campaign times and dent their chances — even if in a small way — in the upcoming elections. Rampur will go to the polls on April 23 and campaigning will end by April 20 evening. Election in Sultanpur will be held on May 12. Earlier, the commission had ordered similar suspensions to Yogi Adityanath and Mayawati for allegedly provoking communal feelings. At a meeting in Deoband, Mayawati had warned the Muslim community to not split their votes between the Congress and her alliance. Days later, taking a dig at Mayawati, Yogi said, "If the Congress, the Samajwadi Party and BSP have faith in Ali, then we have faith in Bajrang Bali." This comment fanned protests from the opposition. Here, Ali refers to Prophet Mohammad’s successor, revered by Muslims, whereas Bajrang Bali is the Hindu deity Hanuman.